We’ve just witnessed the release of what’s claimed to be the highest capacity PCIe NVMe SSD ever seen, and according to the maker, it’s the most efficient solid-state drive across all models. 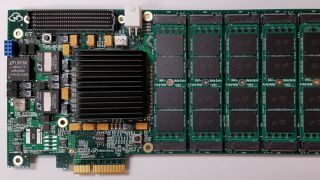 NGD Systems has revealed its Catalina SSD which uses 3D TLC NAND flash in a card (PCIe) format, with a potential capacity of up to 24TB. The drive is shipping immediately, although no pricing was mentioned. Obviously enough, it’s not going to be cheap. This SSD is, unsurprisingly, targeted at heavyweight data centre usage, but as ever it’s representative of what we can expect in terms of the average PC further down the line. The Catalina SSD is optimised for read-intensive usage, and NGD is positioning it for the likes of media servers and content delivery networks. It makes use of the firm’s Elastic FTL (Flash Translation Layer) algorithm and ‘advanced error correction’ capabilities, plus it offers some very impressive chops on the power efficiency front, using under 0.65 watts per terabyte. NGD notes that this is more power efficient than any other SSD out there, and indeed more frugal than the biggest enterprise hard drive which is currently shipping. Of course, we have seen bigger SSDs than this, such as Seagate’s 60TB whopper revealed last summer – although that’s a chunkier SAS drive as opposed to a PCIe card. Samsung reckons it will have a 100TB SSD on the market by the end of the decade, although these sort of high-capacity drives won’t be remotely affordable for a good while longer.